A chip dubbed the Radio Frequency Cochlea has been developed by MIT engineers Rahul Sarpeshkar, associate professor of electrical engineering and computer science, and his graduate student, Soumyajit Mandal. The device can be incorporated into a universal or software radio architecture that is designed to efficiently process a broad spectrum of signals including cellular phone, wireless Internet, FM, and other signals. ...in her ears the little Seashells, the thimble radios tamped tight, and an electronic ocean of sound, of music and talk and music and talk coming in, coming in on the shore of her unsleeping mind. 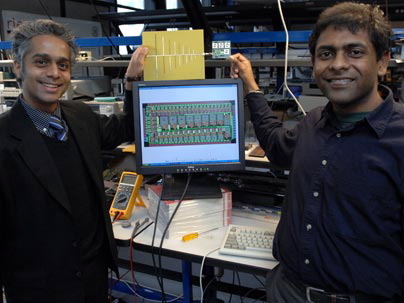 See a fascinating video interview with Rahul Sarpeshkar and a discussion of bioelectronics. Read more at MIT; thanks to Winchell Chung for suggesting this story.